September 15, 1941 is the groundbreaking ceremony for the Basic Magnesium Incorporated (BMI) and over 13,000 workers move into a tent city outside of the BMI plant. 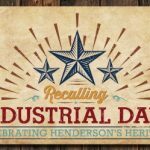 By January 10, 1944, the Basic Townsite is officially renamed Henderson and the BMI plant produces more than 166,322,685 pounds of magnesium ingots for the war effort. Postwar housing shortages in Las Vegas sparks Henderson’s growth. The Henderson Betterment Group commits to building recreation facilities that will attract families. 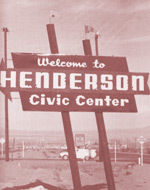 On April 16, 1953, the City of Henderson, Nevada is officially incorporated. January 1963 is the groundbreaking for Henderson City Hall. Congress passes the Henderson Land Bill, which doubles the size of the city. The Lake Adair project stalemates. Green Valley development is approved. BMI plant is modernized to produce boron trichloride for the US Air Force and NASA. In 1972, Clark County Community College begins conducting classes in Henderson. Levi Strauss & Company opens its doors in 1977. Henderson experiences rapid expansion. Suburban residential development replaces heavy industrial growth. The Henderson Convention Center is built in 1982. May 4, 1988 fire destroys the PEPCON plant. Sign up and receive the latest information. Your email will never be shared. An interactive look back and ahead! Dust off that old scrapbook and help us create a timescape of Henderson, Nevada through images. Particpate in this new project! We're looking for Henderson's long-time residents to have their stories recorded. Get involved! 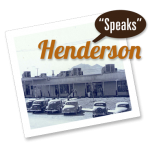 The Henderson Historical Society (HHS) is a gathering of like-minded individuals who share a deep respect for the city’s history and are actively engaged in protecting the stories, photos, and folklore from Henderson’s past. A virtual, online association, the HHS provides a place for supporters to explore the character, charm, and events that built this great city. Supported by our Membership, an enthusiastic cadre of volunteers known as the Friends of the HHS, and a variety of Projects & Events, and educational outreach, the HSS provides a unique opportunity to discover the remarkable history of Henderson and the city’s contribution to the growth and development of Nevada. Our Mission: To foster public awareness and pride and to preserve the history of Henderson, Nevada for future generations.